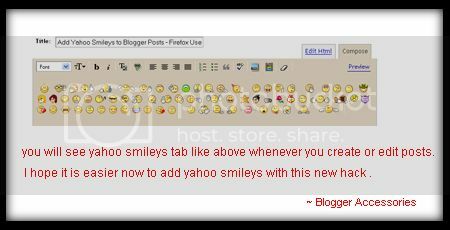 This Blogger Hack is focused Firefox Users who want to add Yahoo Smileys to Blogger Posts. This hack don't work for other browsers like Internet Explorer , Opera , etc . I kindly request other browser users to see this post " Add Yahoo Smileys to Blogger Posts " , if they want to implement this hack in blogger. open Firefox browser and install " Grease monkey " by visiting Grease monkey Addon ! and restart browser . that's it we have successfully added yahoo Smileys to blogger. See you soon with a new hack .